Remember those old Facebook “games” that you played via the “Notes” feature back when you couldn’t write long statuses?!?! Well, this was an old one that I dug up! Name twenty films you’ve seen that will always stick with you. First twenty that you can recall. Don’t take too long to think about it. LOL!!!!! Yes!! Or, my other fave quote from it …. “What is this?!?! Velvet?!? !” LMBO!!! This is a great list! 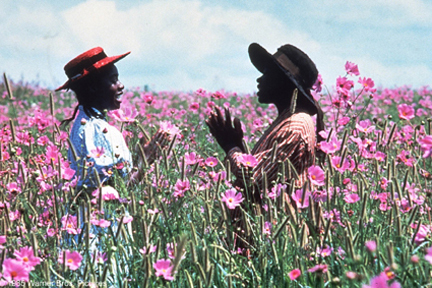 The Color Purple is definitely up there for me…in fact, whenever I’m home sick, I pull out my dvd and watch it. No matter how many times I’ve seen it, I still uncover something new with each viewing. In fact I watch it so often that when I finally got around to reading the book I didn’t like it because it was too different from the movie. *lol* Others? Boomerang, Coming to America, Shawshank Redemption…many others, but those are the first that come to mind. Awwww yes!! Shawshank Redemption is an awesome movie!! And, I could totally see watching the movie so many times that the book doesn’t seem as good!!! But, I can also see reading it and seeing a new movie in your head!! i love lil shop of horrors……watching princess bride……never seen it. I love your pick of movie quotes! Yes – too funny! YES!!! You know we all quote that “Until you do right by me …” Color Purple line at some time or the other in our real lives! … and put our fingers in that hex position as we say it! And that ugly line is the best! She reclaims her power!!! Ahhhh, y’all making me want to watch it right now!! Bill: As you know, l’m quite keen on comic books. Especially the ones about superheroes. I find the whole mythology surrounding superheroes fascinating. Take my favorite superhero, Superman. Not a great comic book. Not particularly well-drawn. But the mythology… The mythology is not only great, it’s unique. Now, a staple of the superhero mythology is, there’s the superhero and there’s the alter ego. Batman is actually Bruce Wayne, Spider-Man is actually Peter Parker. When that character wakes up in the morning, he’s Peter Parker. He has to put on a costume to become Spider-Man. And it is in that characteristic Superman stands alone. Superman didn’t become Superman. Superman was born Superman. When Superman wakes up in the morning, he’s Superman. His alter ego is Clark Kent. His outfit with the big red “S”, that’s the blanket he was wrapped in as a baby when the Kents found him. Those are his clothes. What Kent wears – the glasses, the business suit – that’s the costume. That’s the costume Superman wears to blend in with us. Ahhh …. good stuff. Good stuff. LOVE My Big Fat Greek Wedding!! I’ve watched that tons of times!!! Nurse Darlene: Multiple fractures. Internal hemorrhaging. We need immediate x-rays. Reed Palmer: Too late for that. We’ve got to open him right up. Nurse Darlene: Whatever you say, Dr. Palmer. Randy Bodek: Doctor…? Dr. Pa… Dr. Reed Palmer? Reed Palmer: That’s right, Randy. I believe you know my wife. Reed Palmer: [restraining anesthesiologist] No anesthetic! I have so many it isn’t even funny but I am going to narrow it down to the top 5. The Incredibles – BEST CARTOON MOVIE EVER! This is why you have to do it fast … because you named six more AWESOME movies to (in addition to the ones that I already mentioned in reply to the comments above)!! The Incredibles was awesome … But Anastasia and Beauty and the Beast probably tie for my fave animated movies of all time. Tombstone is AMAZING!! Love it! Primal Fear?!?!? I lost my MIND at the end of it and that’s when I fell in love with Ed Norton!!! Just knew he was the next Robert DeNiro!! The Count of Monte Cristo …. I’ve posted about that on here. I KNEW that Jim Caviezel should be cast as Batman/Bruce Wayne after that!! I don’t own many DVDs and the ones I own, I don’t watch often. I’ve watched the Count at least 6-7 times!! LOVE that movie!! The Avengers. C’mon. One of the best Superhero movies of ALL time!!! Breakfast Club … right up there with Sixteen Candles. Did you ever see the ep of Victorious where they spoof it?!?! I posted the two part videos on here, but they got ripped off of YouTube for copyright infringement, I guess. It was HYSTERICAL!!! “You’re so conceited Tory. You’re so conceited.” LMBO!!! -Gone With the Wind….. Yes, really! Is this MY Shauna:)?? Okay, Man on Fire?!?! Forget Taken. MOF is the BEST vengeance movie EVER!!! And what you know about Just One of the Guys?!?!? Were you even born when that came out?!?! LOL!! Real Genius and Weird Science WERE good too!! Finding Nemo is my fav movie like ever… I can watch it for eons to come! I’m going retro and adding some old gems: Uptown Saturday Night (the original Biggie Smalls), Claudine and Superfly (the best soundtracks EVER- RIP Curtis Mayfield), Which Way Is Up (cop this if you want to choke from laughing so hard), Shaft (shut yo mouth – my Dad, all 6’2 of him, had the full length leather trench coat and was the fly Dad on my block) and To Sir With Love (Sidney Poitier dancing at the prom to some Blue Eye Soul is so smooth – I love that song!). You guys reminded me of some great movies – I need to cop some of these for the holiday season! -and as an odd ball with lots of blood and guts; 300. I loved Transformers, but that one women is always in the way of all the cool autobots!! The Avengers RULES, Iron Man rocks! Btw Shelli, your analysis on Superman was really interesting – I’ve never thought of him from that perspective (yes, I’m black and nerdy!) and think it’s a wonderful concept! Some people are just born that good :)! The sixth sense scene when that ring drops and rolls across the floor – that’s when it came to me! OMG -started bawling right there in the theater. No tissue, just my sleeves! LOL! ..oh mayehn, me and my typo’s: that was supposed to be: minimalist and worth. Sorry! This is by no means it but these are the movies that came right into my head when I read your post.